» Fun Friday Phonics Game! I just finished this game for you and I hope you love it! “Pin It” Phonics Game is an exciting new play style that I think your kids are going to LOVE playing. This game can work for a single student right up to a big ‘ol classroom full of little learners! 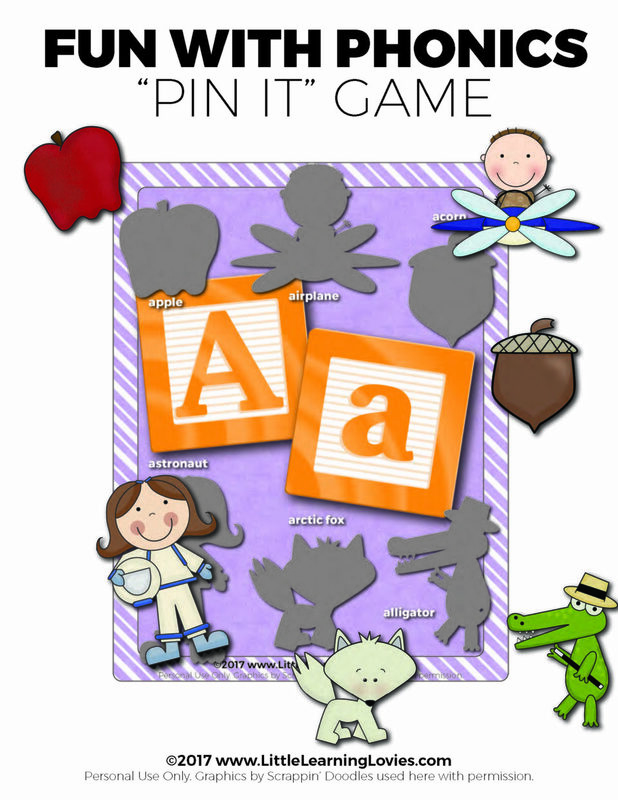 What’s a “Pin It” Phonics Game? So here’s how I suggest playing. Print out a letter poster and the shapes that go with it. Laminate them all and cut the shapes out (as near to the actual shape as you can). Hang the poster up on the wall and lay the shapes out on a flat surface with a little fun tack on their backs. You can choose to blindfold the player or not, depending on their age and skill. Kids study the poster to remember the shapes and where they are. Then, on their turn, they pick a piece from the table, if blindfolded they use their hands to figure out what the shape is, are pointed in the right direction and then they do their best to tack that shape onto it’s shadow. Turn this phonics game into a “take it to your seat” sort of activity by putting one letter mat, all of it’s pictures, and three or 4 pictures from other letters into a bag. Have the child match the pictures to the shadows and put the ones that don’t match back in the bag. You can make a set like this for the whole alphabet by printing one full set and then one second set of just the pictures. Hang 3 or 4 of the posters on the wall and lay out ALL of the pictures that go with those letters with a little fun tack on the back of each one. Grab a timer and see how fast your child(ren) can put all the pictures on their shadows. Same as above, only use the entire alphabet! That’s 26 posters up on the wall and more than 145 pictures! Have your child guess how long they think it will take and then use the timer to see how close they are. I want you to TRY this game out for FREE! Below, you can download letter A to try completely free. If you love it, go grab the whole alphabet! HURRY, though! This is on sale right now for 1/2 price. Don’t miss out! Enter your information below to verify that you are on our email list. If you aren’t on it already, we’ll add you on so you don’t miss out on more fun like this! Once you click “Download” the free file will begin downloading immediately. ENJOY! Want the whole set right now? I’m so glad that you do! A LOT of hard work went into this one and it’s always such a sweet feeling to know you appreciate the time I put into every one of these printables. GO GRAB THE FULL ALPHABET SET NOW!